In case you haven’t heard Thatcher has died, I know this from the stream of vitriol that my Twitter and Facebook feed have become. While I’m old enough to remember Thatcher, and I’m liberal enough to be one of the people who should dislike her, I didn’t live in the UK during her supposed reign of terror so I don’t really harbour her any ill will. I know that a lot of people hated her for a lot of reasons, but lets be honest she was just a woman who was elected to power and did what she thought was right. What is done is done and can’t be taken back, her death doesn’t change that, it doesn’t make your life any better. Let her have a little dignity. I found this by clicking on a random link to the side of a YouTube Video, it’s a really haunting song and a really messed up video. Tigersushi and Excuse My French are pleased to present the new video for DyE’s new single, Fantasy. Directed by animation wunderkind Jérémie Périn, the video tells the story of a group of highschool kids ready for teenage mischief. They break into the local swimming pool intending a session of innocent nightswimming, in an awkward climate of romance and apprehension. What happens next is for you to discover here. nsfw. “Fantasy” is taken from the DyE album TAKI 183. 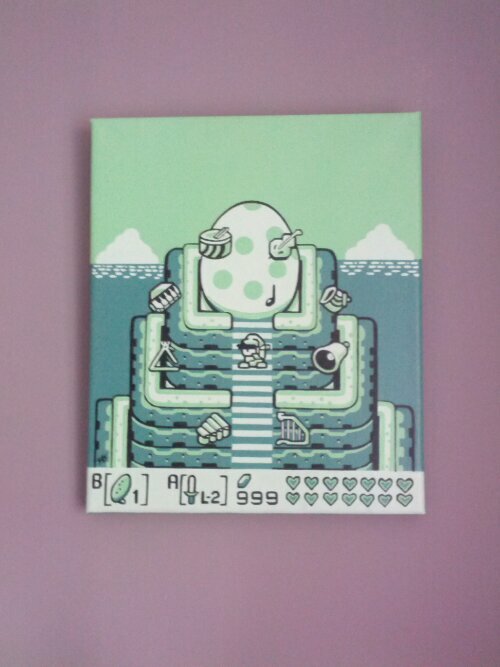 This has been hanging on my wall for over a year now, it’s a painting by Green Castle Graphics of the final scene in Link’s Awakening. I’ve seen a couple of posts on Reddit that reminded me of it in particular a pearler bead rendition of a scene from Crono Trigger, which has to be my favourite game ever, so I figured I’d finally share this. I saw this while walking past Green Castle Graphic’s stall at Sloan’s Market in Glasgow, and I had to buy it then and there. Here is the image in Green Castle’s Facebook Gallery before I bought it. I’m sorely tempted to commission another image by Green Castle I just don’t know what… I have a couple of Ideas though. This cropped up on a friend’s Facebook wall because they had gained a badge on Fitocracy a social network for fitness buffs. I posted the above quote to Facebook because I was annoyed at the number of people that had put up complete and utter crap superimposed on a pretty picture in the interest of looking or feeling deep and meaningful and someone replied with that image. Fair play to them but my point still stands. In the cool but pointless category, Brazilian retailer C&A (Is that the same C&A that used to exist in the UK?) has started displaying the number of likes items of clothing have received on their Facebook page. I was lead to believe that Facebook wasn’t very big in Brazil and they all use Orkut but that’s besides the point. As the venture beat article points out online shopping is usually based on the images, and pictures don’t tell you how well made an item is or how the fabric feels. Something that looks really nice can feel like it’s made from camel testicles. This image is probably fairly accurate, especially the last one… I can’t actually remember where I found this though, It was just open in a browser tab. Probably posted by someone one Twitter or Facebook. Is Liking Something On the Internet a Meaningless Gesture? It occurred to me just now that one thing that FaceBook and Google+ do that Twitter doesn’t is have a mechanism to show passive approval of something. On FaceBook you can “Like” a post and on Google+ you can “+1” it, Twitter has no equivalent. On Twitter you can either comment on a post by replying to it, or you can share it by retweeting. I think the like is an empty gesture, it holds no meaning, and it serves only to boost the ego of the poster, also it’s prone to ambiguity, if someone posts a status update saying something like “My dog died today, he was a lovely hound” and someone likes that what does that mean? does it mean that you like the fact that the dog died or that you are being sympathetic to the person for their loss? If you are being sympathetic and all you can be arsed doing is clicking a button then you are a pretty lazy, a person who was actually sympathetic would say something passing on their condolences, if you like the fact that their dog died because the dog ate your hat well maybe you shouldn’t be sharing that fact. What do people think is liking a status update an empty gesture? Note: I’m not talking about liking things on services like Pinterest, StumbleUpon or Last.FM where your likes are actually stored, that’s more curating things you like rather than silently expressing that you agree with/approve of a statement.